The Buff-banded Rail is a medium-sized stout rail with short legs. It has a distinctive grey eyebrow and an orange-brown band on its streaked breast. The lores, cheek and hindneck are rich chestnut. The chin and throat are grey, the upperparts streaked brown and the underparts barred black and white. The eye is red. Young birds are much paler to white underneath, with indistinct bars and only a faint orange-brown tint on the breast. Downy chicks are fluffy black. This rail walks slowly, with tail raised and flicking constantly. The orange-brown breast band distinguishes the Buff-banded Rail from the similar but smaller Lewin's Rail,Dryolimnas pectoralis, which has a rich chestnut crown and nape and a proportionally longer pink bill. 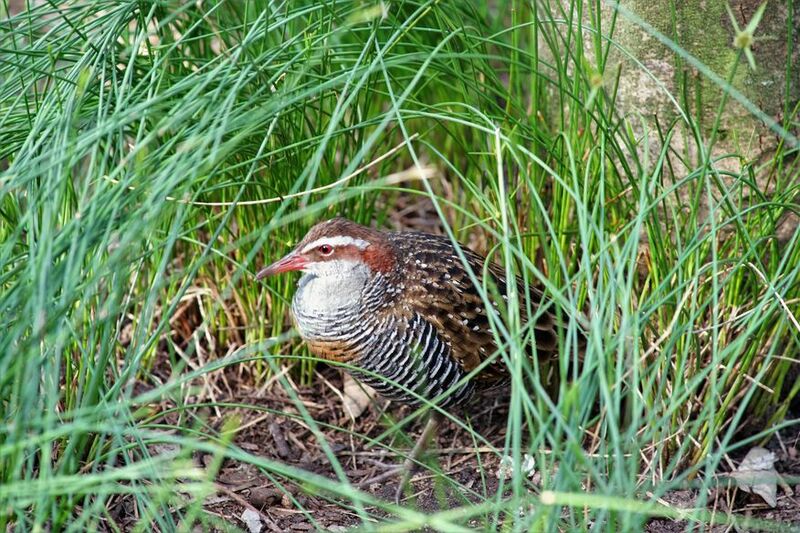 The Buff-banded Rail is widespread in mainland Australia, particularly along the eastern coast and islands, and on Norfolk and Lord Howe Islands. The Buff-banded Rail is seen singly or in pairs in dense reeds and vegetation bordering many types of wetlands or crops. It makes widespread use of artificial wetlands like sewage ponds and drainage channels. The Buff-banded Rail is resident and possibly locally nomadic, though little is known of these movements. 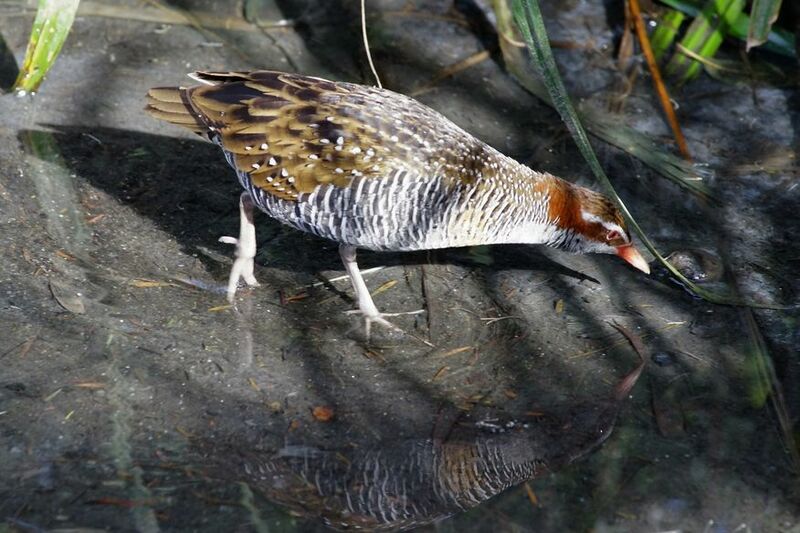 The Buff-banded Rail feeds on crustaceans, molluscs, insects, seeds, fruit, frogs, carrion and refuse. It mostly feeds early in the morning and the evening. Breeding is poorly known, but the Buff-breasted Rail nests in long grass, tussocks, rushes or crops. It makes an unlined cup-shaped nest of grasses or reeds. Both parents incubate and the young will leave the nest within 24 hours. Both parents remain with the young, which usually feed themselves, though the female may feed them as well. Two broods may be raised in some seasons.